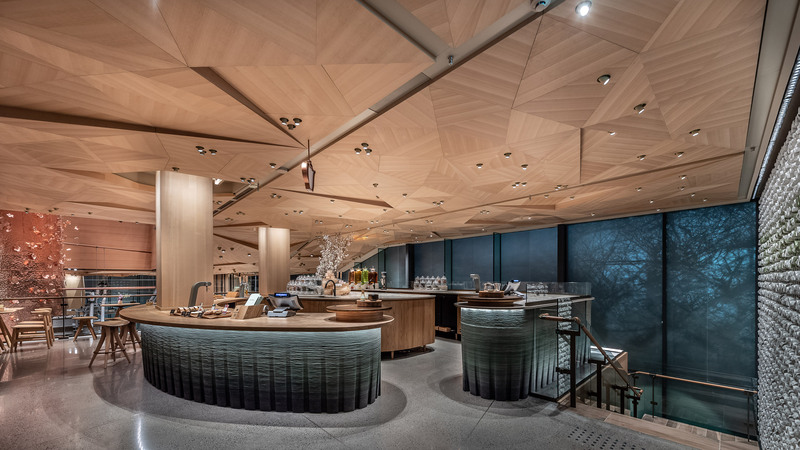 Japanese architect Kengo Kuma has teamed up with Starkbucks on a coffee home featuring origami-like ceilings and roads of cherry blossoms, designed to offer customers a more theatrical experience. The Starbucks Reserve Roastery in Tokyo is one of only five in the world, along with branches in Seattle, Shanghai, Milan and New York. 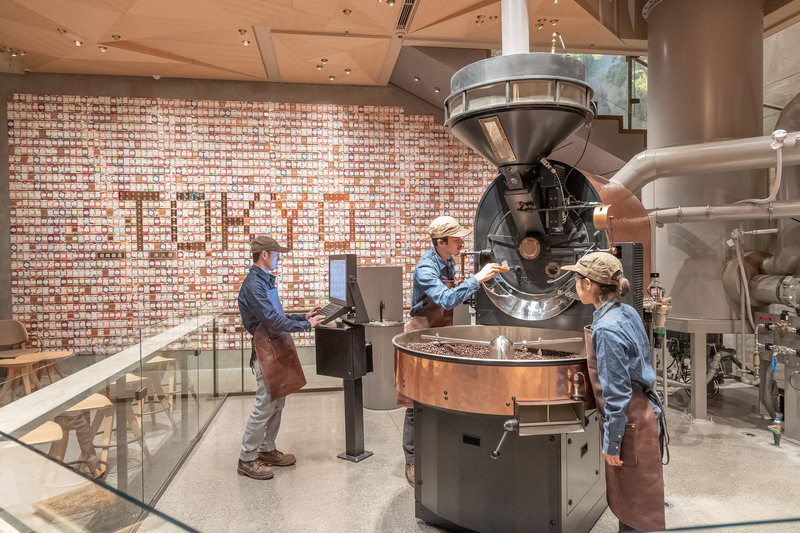 Unlike the brand’s typical coffee shops, these large-scale roasteries offer a premium experience, with opportunities to sample rare caffeinated beverages. 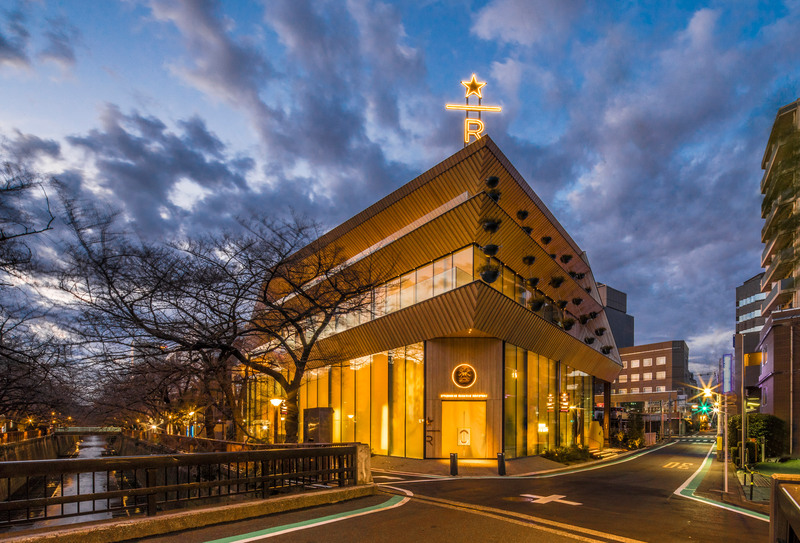 The Tokyo roastery, located in Nakameguro, is intended to reference to Japan’s landscape and traditional crafts. Kengo Kuma designed the four-storey house, which has lumber fins jutting out from its facade to accommodate balcony terrraces. Liz Muller, chief design officer at Starbucks, was responsible for the interior fit-out. A huge copper coffee-bean cask anchors the entrance of the venue, widening upwards through the building’s four floors. Measuring 16 metres high, the cylindrical volume has a mottled surface created by in a process called tsuchime, which insures a small hammer create a pattern of indentations. 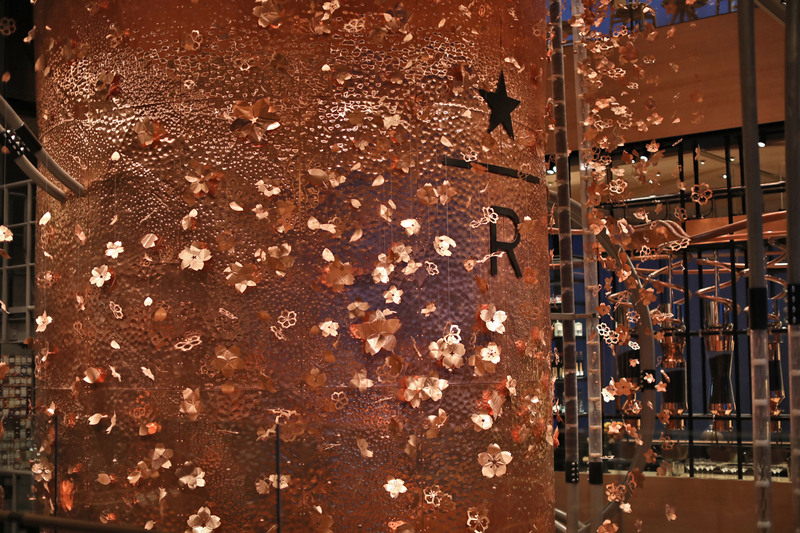 Copper was also used to create hundreds of cherry bud flowers, mimicking those that appear along the nearby Meguro river every spring. These dangle directly in front of the cask on fine pieces of string, so they appear to be floating in midair. The layout of the ground floor is open-plan, to “draw clients into an immersive experience”. As well as areas filled with dining tables and chairs, there is also a small retail region selling Starbucks merchandise and a bakery serving Italian treats like focaccia and cornetti. The floors and walls of the space are slate grey, while the ceiling is lined with triangular blocks of striped timber, intended to recall the appearance of origami-folded paper. This aesthetic continues upstairs. 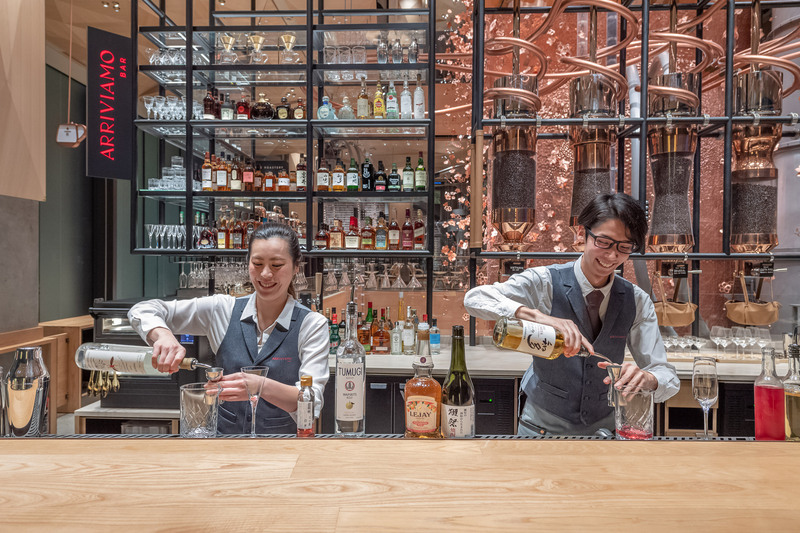 The first floor is is dedicated to Japanese teas, while the second floor plays host to a cocktail bar, Arriviamo, which serves alcohol-infused tipples like espresso martinis. The fourth floor contains a sizeable sofa named Amu- the Japanese term for “knit together”- which can be used for community events and talks. Eventually this level will be used as a train space for those looking to enter coffee-related professions. 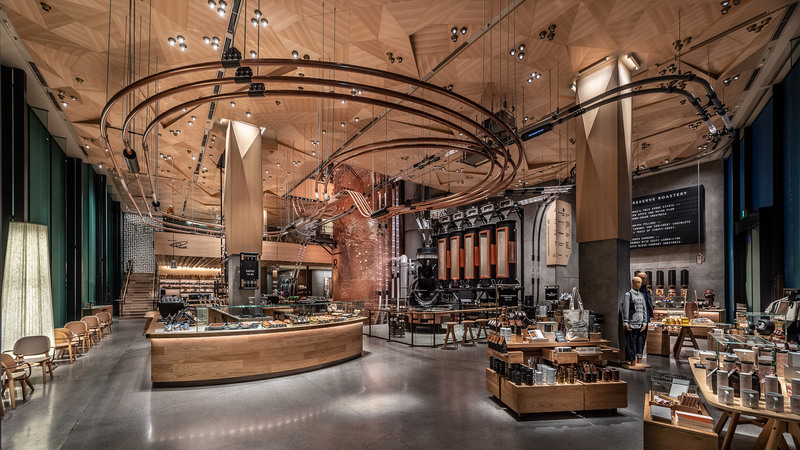 The first Starbucks Reserve Roastery opened in Seattle in 2014, just a few blocks away from the first ever Starbucks coffee shop. The last to open was the New York outpost, located in the Meatpacking District, which boasts a network of copper pipes that transport coffee beans between rooms. Kuma was an obvious option for the first branch in Japan, as the architect has previously worked with the brand on other Starbucks branches. Last year the designer stacked up 29 recycled shipping receptacles to form a drive-through Starbucks in Taiwan and also generated a branch beside a Shinto shrine in Dazaifu. Photography is by Kentaro Matsumoto unless stated otherwise. 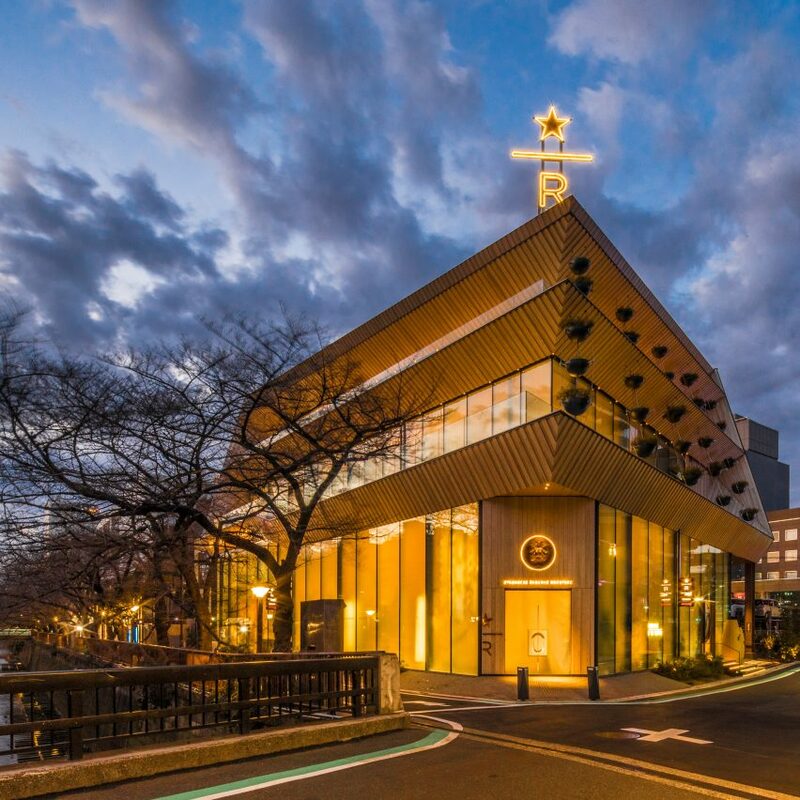 The post Kengo Kuma designs house for Starbucks Reserve Roastery in Tokyo appeared first on Dezeen.